Every marketer’s goal is to grab their audience’s attention and direct it to whatever they are selling. If you do not grab your target audience’s attention then your marketing strategy will have totally failed. With most people having short attention spans, what marketers require is something that can grab an audience’s attention very quickly. One of the best ways to do this is by using visual communication. There are many reasons why visual communication beats other methods of content marketing. These are the reasons why. Visual communication saves a lot of time, time that otherwise would have been used going through walls of texts can now be saved by going through a simple image. Nowadays people are always looking for information that is easy to understand. An image can pass a message very quickly compared to how words can. Communicating with your audience using visuals can convey a message quickly and effectively, saving your readers some time. A picture is worth a thousand words. Instead of filling up pages with words, why don’t you throw in a visual or two to save your readers some time? Visual communication can make ‘boring’ content seem very interesting. It can make a dull subject more lively and keep a customer engaged. Sometimes a person just wants to relax and go through photos and feel entertained. That’s why marketers should always consider using images to present data and visually tell their brand story. Interesting images can easily be shared through social media platforms like Instagram, Facebook, and Twitter. This is a great way to get your name out there and attract an even bigger audience. If you take a look at any social media platform, you will discover that posts that are accompanied by images get more views and shares compared to those that don’t. This further proves that visual communication works way better and faster that non-visual communication. Those who find it difficult to create great visual communication material can even outsource these services from Europe. According to Outsource2EU, Europe is a great place to outsource visual communication services such as video and animation production since most people are well versed in matters of technology. If you are finding it hard to pass a message across to people, you should consider using visualization to back your message up. For example, if you want to show people how a certain product helps people lose weight, why not show them a before and after photo to prove your case? A little visual evidence if how your product works will go a long way. People might forget the nitty gritty of your product but that particular image will remind them what your product does. Visual communication will turn something people find hard to believe into something believable. It is a great way to convert non-believers into believers. If someone was on the fence about purchasing a certain product, a simple image will prove to them that your product actually works, prompting them to finally make up their minds and go for it. That is the power of visual communication. A good logo will make people remember your company, product or service. Most people identify businesses with their logos. If you invest in great visual communication, you will find it easy to build your brand identity. People will associate your logo with your product or service. The biggest brands in the world are usually identified by their logos. So as a marketer, consider coming up with great logos to get your name out there and leave a mark. Visuals trigger emotions and influence customers’ buying decisions. Visual communication can invoke certain emotions and make a customer get more interested or intrigued with your product. It might bring out feelings of nostalgia and influence that person to buy your product simply because it reminds them of a certain situation they were in. Images can bring up certain memories and make someone associate your product with that particular memory. A person is going to remember an infographic they saw somewhere and forget something they read or heard. This is because a visual leaves a greater impact than written information. Photos or graphs are much easier and interesting to remember. If you want to communicate with your customers and make them remember exactly what you said, then try using visual communication – since it is also on the most important things if you want to go viral. 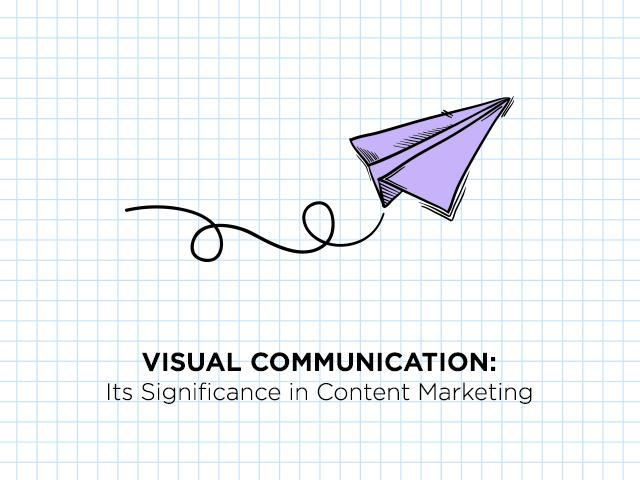 Visual communication has numerous benefits to content marketing. The good news is that there are so many resources that can help one come up with great visual communication. There are professionals and software that help people create infographics, graphs, videos or whatever visualization method a person may want to use.